YOSHITAKA FUNAKOSHI (WAKA SENSEI – PART ONE). By Graham Noble. SENSEI TOM KOMPIER COURSE. Report By Clare Worth. LIFE LESSONS: SENSEI SHOJIRO KOYAMA.By JP Trevor. YOSHITAKA FUNAKOSHI (WAKA SENSEI – PART ONE CONTINUED). DANIEL PAQUETTE 5th Dan SHOTOKAN-RYU KAI. By David Palumbo. INVESTMENTS – GOOD AND BAD. By Mike Clarke. BREATHE LIFE INTO YOUR KARATE. By Charlie Wildish. 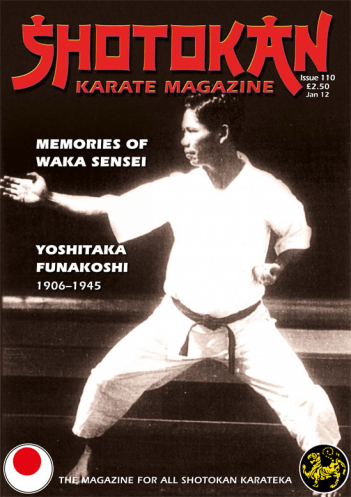 I can't count the amount of times I've been asked to supply information or feature an article about Yoshitaka Funakoshi, the son of Gichin Funakoshi, Shotokan's founder. But the truth is that there is virtually no information or written work about this enigmatic figure from Shotokan's history. Well, here we have a 17,000 word Two Part article (part two in the next edition) by the highly rated, world acclaimed Karate Historian, Mr Graham Noble. This is in fact a Chapter from an up-coming book by Graham Noble on the History of Karate. Many people will remember Graham's work from the great magazine of the 1970's and 80's, Terry O'Neill's 'Fighting Arts International'. One of the best Martial Arts magazines ever published in my opinion. I also have to say a special thank you to sensei Mitsusuke Harada and the Shotokai people for supplying many of the rare photo's of Yoshitaka. Graham Noble has done years of research, including rare translations, gathering information etc, on Yoshitaka, who many feel was a massive influence on the development of modern-day Shotokan Karate. He's credited with creating fudo-dachi, as well as making kumite just as important a part of karate training as kata, which was the main focus of his father's (Gichin's) karate. I have found it a great historical insight because we have never heard much about Yoshitaka in the past. One thing I found interesting was the photo (which will appear in Part Two next issue) of Yoshitaka with Masatoshi Nakayama, the late JKA Chief Instructor. It's very obvious that Nakayama trained with Yoshitaka, the photo was taken in Yoshitaka's back yard with one of his children sitting on his knee. But the JKA never recognised Yoshitaka as a innovator, or major player in the development of modern-day Shotokan, in fact he's never mentioned in Nakayama's many books. I think this is because Yoshitaka's main students were in line with the Shotokai who were totally opposed to the JKA idea and philosophy. It depends which side you speak to about this, but the fact remains that Nakayama trained with Yoshitaka, many people didn't know that before. I think we should all be interested in the history of our art to fully understand what we are actually practicing, and where it came from. It's part of our karate education. So don't miss part two of this fascinating story in the next edition of SKM. We have an interview with a senior American (not so well known) sensei, Daniel Paquette 5th Dan. As you probably have realised by now, I am more than fond of featuring karateka in SKM who have huge experience even though they may not be household names. And I often think that these people have a great deal of insight to offer, it's just that they are not famous. I used to watch the way Sensei Koyama walked into the gymnasium at the (SCC) Scottsdale Community College when I was in his classes in the 80's. I'd try to pretend I was him and tried to walk like him and make his facial expressions because I thought this would make me do better karate. I might have felt like my karate improved, but it had only done so on the surface. Inside me was a huge black-hole of confusion about life and about what karate meant. My techniques were muscle-driven only. My ego was doing the karate. I got a rush from watching bits of old cotton fly off my worn-out gi; it was dramatic and I'd roll up my sleeves – maybe I liked the freedom of bare arms – because I knew it might make me look 'cool'. As my macho way of doing karate increased so did my feelings of depression and despair. Especially when I watched Sensei Koyama because I knew I could never reach that place that Sensei lived in; a place of total freedom from mind and ego. And I knew that Sensei knew that I was not in that place, that he could see into my abyss. A few years later in a psychiatric hospital in Phoenix after a major breakdown, (my life as I knew it had ended) I would practice Shotokan on the parched grass outside the mental wards. Even though I was crumbling inside I still rolled up my sleeves and enjoyed it when old bits of cotton flew off my gi. Although I was in meltdown my ego hung on tight. This was the beginning of a battle that lasted for years, which I've survived mostly thanks to Sensei Koyama's teachings. JP Trevor (left) then a Brown Belt with his sensei Shojiro Koyama. Phoenix dojo late 1980's. Today, years later I think perhaps I understand a little of what Karate is about. Sensei showed me there is a 'door' to freedom, (becoming one with the technique is one of the many benefits) but inside I was a child who didn't know how to open this door. When you are made to feel insignificant and unnecessary in childhood, you inflate yourself to survive, and the ego is capable of great inflation. The greater the inflation the bigger the battle. The biggest one of all is humility. Once I made a ten-minute amateur film about a guy who visits his Sensei up on a hill to take his Shodan exam. It was a short atmospheric movie and I played the student. Sensei Koyama came to my apartment in Scottsdale where he and some of my friends watched my movie. Sensei was sitting in front of me and he could not see that I was sinking into a hole in the ground with embarrassment. A few years later I was having dinner with Sensei in Phoenix and I asked him if he remembered my movie. He said yes. I told him how embarrassed I still was that I had invited him to see it. He looked at me with big eyes and said, "Golly, you have changed!" But I knew I still had a ways to go in the art of humility. I especially knew this when I'd watched Sensei teach at the 7th street dojo later that evening. I was watching him and thinking; what am I seeing here, something very deep. Then I realised; I was watching humility. I suddenly felt very small because I had practiced thousands and thousands of kicks and punches and blocks but had never experienced this complete absence of 'pretense' that I was witnessing in Sensei. And therefore I had never gone through the 'door' that Sensei had shown me. One evening, after Friday-night training at the dojo, Sensei asked me to go back onto the dojo floor. The lights were off and the only the sounds were the Phoenix traffic and the clock. Sensei told me to go into a low kibadachi stance. He did too. I knew how long we'd stayed in that position because the dojo clock was on the wall in front of me: about an hour. Sensei was like a silent rock. I was like a quivering tree with my legs on fire. Sensei had shown me the door again. But I still didn't know how to go through it. To let go of my mind would mean also dropping how I'd lived, how I'd been 'hard-wired'. But I knew that if I wanted to free myself from the mind and experience my own katas from another dimension, I would have to change deeply. The ego is the last frontier to pass. It is so powerful it can create wars. Sometimes I would train in the SCC gym and I was aware that if I was practising alone, I felt irritated and lacking in energy. My ego was not interested in doing karate without spectators. But as soon as someone – especially a girl – walked into the gymnasium; my energy suddenly increased and my ego was very happy and proud of showing what I could do. When that happened though I also became depressed in a deeper place, because I knew that I was doing karate for validation and approval. I wanted to say to Sensei; I know you want to see if I've learnt karate – not the techniques or the movements – but that had I let go of fear and the mind." I knew I had not because my techniques were still those of a beginner. I felt so down after the lesson was over because I knew this 'other dimension' existed (the one that Sensei Koyama lives in) but I knew I was light-years away from it. And I knew that in that dimension I could do kata without ego. I had a strange experience in Cancun, Mexico in 1989. A small man with burning eyes followed me in the street and said to me in not very good English, "You do karate!" I stopped and asked him how did he know. The stranger said, "Because it says here on your forehead," he tapped his own forehead and said, "Don't screw with me!" I laughed, he laughed and I asked him what he did. He said he was the President of the Transcendental Meditation Chapter of Cancun, Mexico. Two weeks before I had started learning T.M. in Phoenix. Had he picked up something I was unaware of, I don't know. A few years later a man in a Phoenix shop looked at me as I walked in and I heard him say to my friend "I wouldn't mess with him". I was perplexed. And in a coffee shop in London a woman watched me sit down on a chair and said to me, "So, how long have you been doing karate?" I don't really understand these moments especially as I don't see myself at all as someone 'not to mess with'. I have never been hit and I have never hit anyone (well, I did score a lucky point against Hiroshi with a back-first in my Shodan exam.) I could not have a better teacher than Sensei Koyama and if my techniques are not that great, this is not his fault. He has taught me one thing that will always stay with me: how to walk, how to sit on a chair. Which is maybe what these various people pick up; that perhaps I've gone through the door a few feet, and left a big chunk of my ego outside. And maybe somewhere on a dimension far away Sensei's taken my hand and walked with me through this door for a moment, without my knowing, like a good friend would do. One day after losing my mother and father (I'm an only child) I was in the Arizona Karate dojo and Sensei ushered me into his office and asked me how I was. For some reason I told him I'd never had a brother. He suddenly stood up from behind his desk and smiled and offered me his hand and he said, "I can be your brother." My techniques are so-so, but above all Sensei taught me about love and friendship.